Follow 17-Mile Drive’s red-dotted line to arrive at an enchanting world full of dramatic coastal cliffs, snow-white beaches, mystical forests and iconic golf courses. Discover one of the most scenic drives in the world as you meet the inspiring Lone Cypress, ponder the giant trees at Crocker Grove, digest the untouched beauty at Fanshell Beach, behold the power of the Restless Sea at Point Joe, stroll the boardwalk above the beach at Spanish Bay, and much, much more. Admission to 17-Mile Drive is $10.50 per vehicle. The gate fee is reimbursed with a purchase of $35 or more at all Pebble Beach Resorts restaurants, excluding Pebble Beach Market. Admission is complimentary for overnight guests of The Lodge at Pebble Beach, The Inn at Spanish Bay and Casa Palmero. 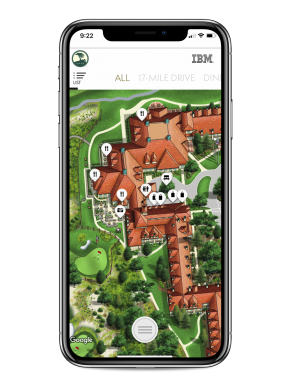 Download the Official App of Pebble Beach Resorts! Located at the heart of 17-Mile Drive across from The Lodge, the Pebble Beach Visitor Center shares the storied century-long history of Pebble Beach Resorts, and also offers guests a retail shopping experience and refreshments. See the latest photos and videos our guests are sharing during their visit to 17-Mile Drive! As a guest of Pebble Beach Resorts, you can reserve two complimentary hours in one of our Lexus test drive vehicles and experience the beauty of 17-Mile Drive. You can also request a driver to transport you throughout the Resorts, our golf courses and the Monterey Peninsula Airport in a luxurious Lexus Guest Transportation vehicle. To help you avoid venturing aimlessly into the maze of neighborhood roads, a red-dashed line marks the 17-Mile Drive tour. More than 1.5 million visitors pass through 17-Mile Drive every year. The Lone Cypress, which was the Midpoint of the original 17-Mile Drive, is believed to be at least 250 years old. It’s one of the most photographed trees in the world. Although the route has changed since it opened in 1881, 17-Mile Drive is still exactly 17 miles long. There are seven championship golf courses along 17-Mile Drive, plus the nine-hole Peter Hay GC. In Golf Digest’s 100 Greatest Public Courses rankings, Pebble Beach GL is No. 1, Spyglass Hill GC is No. 11 and The Links at Spanish Bay is No. 44. Pebble Beach became the first public course to stage a U.S. Open when it was selected to host the 1972 championship. In 2019, Pebble Beach will host its sixth U.S. Open, more than any other course in the last 50 years. Novelist Robert Louis Stevenson was said to have roamed the hills and dunes that now shape the first five holes at Spyglass Hill. The stunning scenery was supposedly his inspiration for the book, Treasure Island. The Monterey Cypress is native to just two locations in the world: the headlands at Cypress Point, and across Carmel Bay at Point Lobos. Today, 25% of Pebble Beach is permanent open space, with over 25 miles of hiking, walking, and equestrian trails for the public to enjoy. 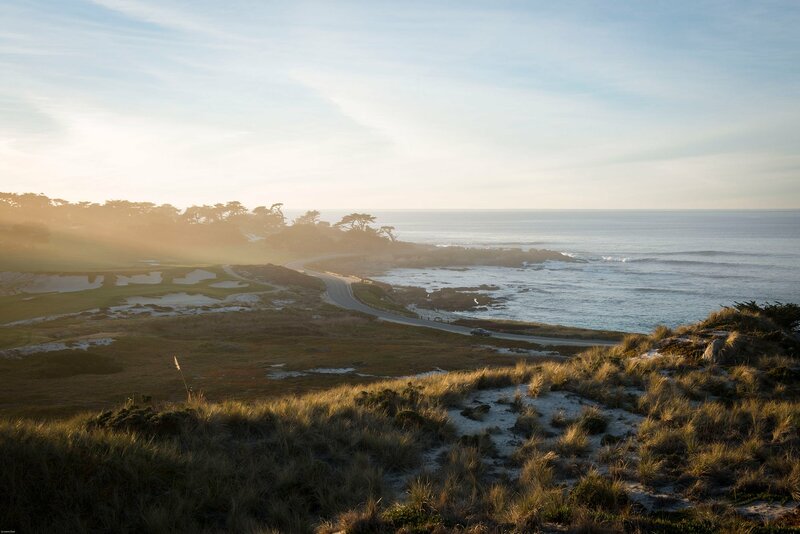 Experience the breathtaking beauty found along 17-Mile Drive, including the captivating Lone Cypress, the inviting snow-white dunes and beaches surrounding Spanish Bay, and the spectacular 18th hole at Pebble Beach Golf Links on Stillwater Cove. As one of the most famous and photographed trees in the world, The Lone Cypress has prevailed on its rocky perch for over 250 years. This wildlife hub is always buzzing with birds and boisterous sea lions. Spanish explorer Don Gaspar de Portela and his crew camped here in 1769 while searching for Monterey Bay, giving the scenic picnic stop its name. There’s also a beautiful boardwalk here that wraps around the shoreline. Home of the churning Restless Sea, early mariners often crashed upon these rocks. This vista offers incredible panoramas looking into Spanish Bay, and toward Spyglass Hill and Fanshell Beach. Built in 1919, The Lodge is the heart and soul of Pebble Beach. The Lodge is perched above the dramatic 18th hole at Pebble Beach Golf Links, and is home to world-class dining and a bounty of boutique shops and stores. The sand is so white here it once restored the pristine beaches of Waikiki. Former the site of an industrial sand mine, it now hosts one of Golf Digest’s Top 50 Courses You Can Play, one of the World’s Best Hotels according to Travel and Leisure, and a memorable bagpiper performance every evening. Enjoy a sneak peek of the spectacular stops that await!